Armenian bhasa (Հայերեն) ek bhasa hae. 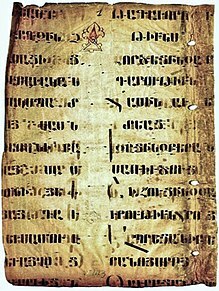 Armenian manuscript, circa 5th–6th century. en.wiktionary.org Armenian<->English dictionary with pronunciations, etymologies and inflection tables. Ii panna ke 17 August 2016, ke 14:37 baje, pichhla time badla gais rahaa.